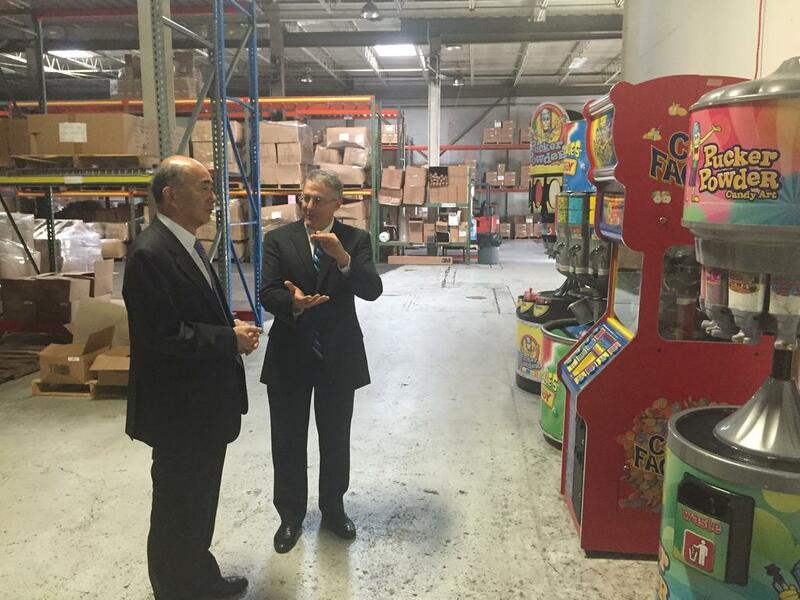 Scott Green (right) describes Creative Concept’s candy to Japanese Ambassador Kenichiro Sasae. Few issues have been as highly-contested as the Trans-Pacific Partnership trade agreement (TPP) – a joint trade agreement being discussed by the U.S., Japan and 10 other countries. The TPP was the primary topic of discussion when Japanese Ambassador Kenichiro Sasae visited Birmingham as part of the SEUS Japan Annual Joint Meeting. Sasae was surrounded by Alabama business leaders for a roundtable discussion concerning the TPP, of which many of the business leaders were in support of. Trade agreements are nothing new for Alabama businesses, with Business Roundtable reporting that in 2013, $8.6 billion of the state’s exported goods – about 44 percent – went to FTA partners. This is a 160 percent increase since 2003, which highlights the increasing importance of foreign markets for Alabama-made products. As Sasae fielded questions and asked some of his own, the conversation focused on the TPP and participating countries, with emphasis put on the potential to move forward with new economic relationships formed through the agreement. Sasae had the opportunity to tour Creative Concepts’ candy-making operations in Irondale, which also played host to the roundtable discussion. As Sasae, led by Creative Concepts founder Scott Green, toured the facility, talk kept returning to what both sides could do to spur economic partnerships between Alabama and Japan. Candy may be a small blip on the export radar for TPP countries, but data from the International Trade Administration shows that foreign import taxes would be lowered substantially for many sectors under the TPP, including: chemicals, information and communication technologies, forest products, transportation equipment and metals and ores. Chemicals represent the state’s largest export sector to see impact from the agreement, at $374 million before the TPP, with a 35 percent maximum tariff. Sasae said if the agreement passes, these tariffs would come down. Additionally, the International Trade Administration cited that if the TPP passes, this sector will see 97.2 percent of exports be made duty-free immediately in countries participating in the agreement. In terms of agricultural exports, Alabama will see boosted demand under the TPP for products such as poultry (the state’s top agricultural export), cotton, soybeans, wheat, beef and veal. The TPP will see poultry tariffs lifted in Japan and Vietnam, and Malaysia will implement tariff-rate quotas for poultry products. Vietnam will also eliminate tariffs on cotton, soybeans and wheat. The forestry sector in Alabama has voiced its concern over the TPP, and representatives did not comment on their position toward the agreement at the recent roundtable. However, data shows that this sector could see some of the biggest gains from participating in the TPP. The International Trade Administration said 98.2 percent of exports from the forestry sector will be duty-free immediately if the TPP goes into effect. Alabama currently sells goods and services to 202 countries and territories, but the market could expand even further as a result of increased partnerships with countries involved in the TPP. Countries participating in the TPP include Australia, Brunei, Canada, Chile, Japan, Malaysia, Mexico, New Zealand, Peru, Singapore, and Vietnam. In 2014, 41 percent of Alabama’s export goods went to these countries – totaling $7.9 billion of the state’s $19.4 billion in exports. “That TPP would improve all of the investment rules and basically improve your own export opportunities, but as a result there is more dynamic development in this state and in Birmingham that could attract investment,” Sasae said. Mobile has the most to gain among Alabama metros, leading the way with $2 billion in exports, followed by Birmingham at $1.8 billion. Japan is the state’s sixth largest export market, which served as a talking point for Sasae during the TPP roundtable. His country imported $593 million worth of Alabama-made products in 2014, with Malaysia trailing at $81 million and Vietnam with $46 million. Alabama’s top exporting market is Canada, which received $4.3 billion in Alabama-made goods, while Germany trailed with $2.2 billion. Sasae said he believes some Japanese companies are looking at the long-term investments and are in the process of raising capital to grow operations in Alabama as passage of the TPP looks likely. What is important to note when looking at Alabama’s export economy is that it is not solely reliant on the major manufacturing seen in the state’s automotive sector, which is the most profitable Alabama export sector. In 2013, 78 percent of companies exporting products to TPP countries were small and medium-sized companies – despite Alabama exporting $6.5 billion in motor vehicles produced by large-scale original equipment manufacturers. “Alabama’s economic well-being is driven by export, and also foreign investment, and this TPP would do the job for both aspects,” Sasae said.